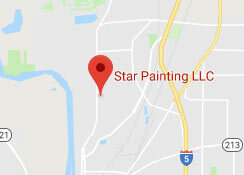 Star Painting LLC has years of experience bringing painting services for homes in businesses in Brooks, Oregon. Our team takes pride in delivering high-quality work and is committed to 100% customer satisfaction for every job we do. Get your painting done by an award-winning painting company. Contact us today! Home to only about 200 homes, Brooks is mostly agricultural land, but that doesn’t mean it’s out of our radar. Rural homes need updating just as much as their urban counterparts. But, given the overall growth in Salem, Brooks is getting more and more attention. And our painters in Brooks, OR are happy to include in our ever-growing service area. We provide state-of-the-art painting throughout the Willamette Valley. Our dependable painters will get your house or facility painted on time and on budget. Painting Northwest homes is our specialty. Get it done right with Star Painting. Brooks is one of many rural communities located just north of Salem. Established in 1878 as a subdivision on the Southern Pacific Railroad, this region has developed into a thriving industrial and commercial hub.